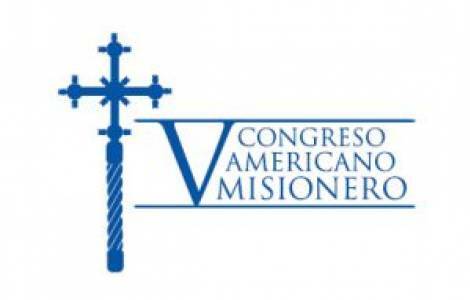 Santa Cruz de la Sierra (Agenzia Fides) - The delegates who will take part in the Fifth American Missionary Congress (CAM 5), which opens tomorrow, Tuesday 10 July, in Santa Cruz de la Sierra, Bolivia, will end on Saturday 14, are arriving. The chosen slogan is "America in mission, the Gospel is joy", while the theme is "The joy of the Gospel, the heart of the prophetic mission, source of reconciliation and communion". "Our families and our Church have opened the door of their home and their heart so that you feel at home", said the Archbishop of Santa Cruz, Mgr. Sergio Gualberti, in a message to more than 2,500 delegates and missionaries who will participate in this continental ecclesial event. "The Church of Santa Cruz and our families become your home, your Church - continues Mgr. Gualberti - together we will walk with great joy, commitment and courage to renew ourselves in our missionary commitment so that all of us can truly be joyous missionaries of the Gospel, committed to proclaiming the Good News in our society, in all our countries of the American continent. According to information released by the organizers of CAM 5 (Episcopal Conference, Pontifical Mission Societies, Archdiocese of Santa Cruz), about 1,200 national delegates, 1,100 international delegates, 80 special guests are expected to take part, while over 400 organizers and volunteers are involved in all the logistic and practical aspects. In the Mass celebrated yesterday, Sunday 8 July, in the Basilica of San Lorenzo, Mgr. Gualberti asked the faithful to accompany "with prayer, affection and collaboration" the works of CAM 5, so that from this event "the firm commitment to a missionary renewal of the Church in America arises". He therefore invited everyone to participate in the opening Eucharistic celebration, on the afternoon of Tuesday 10 July, at 4 pm (local time), in the space in front of the Cathedral of Santa Cruz, which will be followed by the blessing of the statue of Cardinal Julio Terrazas (1936- 2015), Archbishop of Santa Cruz and for a long period President of the Episcopal Conference, who firmly wanted this Congress. The Holy Father Francis appointed His Eminence Cardinal Fernando Filoni, prefect of the Congregation for the Evangelization of Peoples, as his special envoy to the celebration of CAM 5. In his letter of appointment, the Pope writes: "Although We cannot personally participate in this event of great importance for the whole Church of America, we embrace all those taking part ... we appoint you our special Envoy to solemnly celebrate the aforementioned American Missionary Congress. You will be present in our place in the city of Santa Cruz de la Sierra and, given this unique occasion, you will give thanks - since this is what the word "Eucharist" means - together with Pastors and all Christian faithful, for the great gifts of faith and baptism that involve us in the life, death and resurrection of Christ, and to continue the new evangelization with great commitment, joy and trust so that the ecclesial life there is renewed and becomes ever more missionary. You will also remind the Bishops and others who have responsibilities, that in the heart of God there is a preferential place for the poor, for whom He became poor". In addition to delivering the homily during the opening Mass, on the afternoon of Tuesday 10th, Cardinal Filoni will also speak at the inaugural ceremony of CAM 5, on the morning of Wednesday 11 July. The works of the Congress will take place at the Don Bosco College, on 11, 12 and 13 July, with conferences, debates, group work, forums, missionary testimonies, moments of prayer ... on Saturday 14 July, the final day, the celebration of a Missionary Day in the parishes is scheduled. All those who wish to participate are invited to the opening and closing celebrations. The main events will in any case be transmitted by the CAM 5 website and by radio and television broadcasters.